Today, Feed the Children announced their first series of concerts in a new tour brand they are launching. Each run will feature a different cast of artists who are passionate about ending child hunger in the United States. The roots of hunger go deep and affect American children in every state, county, and city in this country, and, in fact, one in five children is at risk of going to bed hungry tonight. That’s why The Table Tour is partnering with Feed the Children to help connect fans and artists with children who need support. The Table Tour is scheduled to make multiple stops around the United States this spring. Artists for the first leg of tour dates in February and March will include multiple-award-winning artists Brandon Heath, Love & The Outcome, and Nichole Nordeman. Then an additional set of concerts, to be announced shortly, hits the road in April and May. It will again feature Brandon Heath and Love & the Outcome, and adds iconic artist and songwriter Steven Curtis Chapman along with Ellie Holcomb, known as part of the band Drew Holcomb and the Neighbors, and now branching out as a solo artist. A table brings people together. Tables come in many shapes and forms, but each serves the same purpose: nourishment and fellowship, two truly life-giving experiences happening in one place. It might be a dirt-floored hut in Africa, a wooden pallet in Mexico, or a reclaimed barn-wood table in Manhattan, but wherever tables are found, communities are born. That is the vision of The Table: building community with artists and fans. Brandon Heath is one of the best in the industry at telling stories through his music, and the next chapter is about to start. On February 10, Brandon will release a new album of compelling and personal stories entitled, No Turning Back. Heath is a seven-time Dove-Award winner (twice for Male Vocalist of the year), multiple Grammy-Award nominee, and Emmy-winning songwriter known for his radio hits including four #1 singles—Your Love, Wait & See, I’m Not Who I Was, and Give Me Your Eyes. Brandon Heath seems headed to the top of the charts again with the title track of his upcoming release No Turning Back already top 15 on the AC chart. Heath plans to share stories, fan favorites, and introduce the audience to his collection of great new songs during his set. Love & The Outcome is the emerging husband/wife duo of singer/songwriter Jodi King and bass player/songwriter Chris Rademaker. They believe Love & The Outcome is both a name and life story. The duo sold their Canadian condo and set off on an international musical road trip. Love & The Outcome were recent winners of three Covenant Awards (including Album of the Year and Group of the Year) at the Canadian Dove Awards show held in British Columbia. Adding momentum to the success they are already having, their singles King of My Heart and He Is With Us are exciting fans as to what they will do next! One of Christian music’s most profound singer/songwriters, Nichole Nordeman, has seen critical acclaim throughout her career. She garnered awards for Female Vocalist of the Year, Song of the Year, Songwriter of the Year, and others, as she climbed to recognition as one of Christian music’s premier artists. In 2003, Nordeman was honored with six Dove Awards by her industry colleagues before stepping away to be home and raise her children—her greatest treasures, Charlie and Pepper. Now, Nordeman is returning to active touring and recording after her multiple-year break. A self-described “wrestling poet,” she is also an acclaimed author. Nordeman’s new music is hitting radio airwaves in the next few weeks with a brand-new single. Fans and gatekeepers are ecstatic about her return and anxiously awaiting Nichole’s upcoming album, yet to be titled, bowing later this year. Ellie Holcomb has a clear vision for uplifting the weary and wounded who need a reminder of who God is—and how He loves them—and has already been connecting on a deep level. Whether she was spinning confessional tales of romantic heartache during her college years, collaborating with her husband Drew as part of his band, Drew Holcomb and The Neighbors, or penning her personal reflections of God’s faithfulness as a solo artist, singer/songwriter Ellie Holcomb has always viewed music as the ultimate bridge-builder. Inspired by God’s Word, Ellie recorded and released two EPs full of songs based on the Psalms and other scriptures, and now with Holcomb’s first solo full album, As Sure As the Sun (Full Heart Music), once again, scripture is intentionally at the forefront of all 10 tracks. Her debut solo radio singles from the album, The Broken Beautiful and Marvelous Light, have been quick-climbing audience favorites. Steven Curtis Chapman has sold 11 million albums, recorded 48 No. 1 radio hits, won five Grammy Awards and an American Music Award, and is Christian music’s most-honored artist, with an unprecedented 58 Dove Awards. Since his recording career began in 1987, Chapman has recorded 18 full-length studio projects, his most recent released in the fall of 2013 entitled, The Glorious Unfolding. Touched and forever transformed by the miracle of adoption in their own family, Steven and his wife Mary Beth founded an organization called Show Hope, and it has become a leader in the movement to care for orphans. Steven and Mary Beth Chapman have been married for 30 years and have six children—three biological: Emily, married to Tanner (and mom to their granddaughters Eiley and Della); Caleb, married to Julia; Will Franklin, married to Jillian; and three adopted daughters: Shaohannah Hope, Stevey Joy, and Maria Sue, who is now with Jesus. For the latest on ticket information for both runs, visit TheTableTour.com. Tables bring people together and the vision for The Table Tour is no different—to build a community of artists and fans. 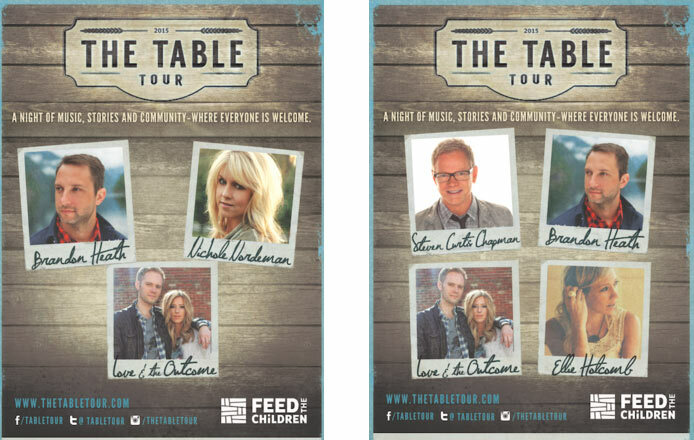 The Table Tour is a unique concert-like experience showcasing artists coming together, sharing both in song and story, welcoming attendees to pull up a chair, and raising awareness and support for Feed the Children and their efforts to end childhood hunger in the United States. Feed the Children is one of the world’s leading anti-hunger organizations, dedicated to creating a world where no child goes to bed hungry. Since 1979, Feed the Children has grown into one of the largest U.S.-based charities, accredited by GuideStar Exchange and the BBB Wise Giving Alliance, with a 4-star rating from Charity Navigator. By banding together with partners, donors, and communities to defeat hunger, Feed the Children distributed over $344 million in food, essentials, educational supplies, and medicine to over 10 million individuals in the United States and 18 other countries in fiscal year 2013. Visit http://www.feedthechildren.org for more information on Feed the Children and its new brand. Just found out that Kristian Stanfill’s teaming up with recording artist Brandon Heath for the new Spring 2011 “Leaving Eden Tour.” Heath just released his latest album by the same name, a week ago to wide acclaim. Cities include Waco,TX, Panama City Beach, FL and Omaha,NE. Stanfill’s star is definitely rising, 2 songs of his new album, Mountains Move, really signalled a big turn for me in his songwriting ability. “Day After Day” and “Always” are seriously two exceptional songs, especially live. To me they are of the calibre you’d expect from David Crowder Band or Chris Tomlin. So I was very impressed these songs when I heard them for the first time. “On this tour, Brandon will be hosting the Leaving Eden Soundcheck Session each night before the show. Leaving Eden Soundcheck Session participants will be treated to a unique acoustic performance from Brandon Heath before the general public is allowed in the building. Attendees will also get a limited edition Leaving Eden Soundcheck Session poster signed by Brandon that is only available to participants of the Soundcheck Session. Concert goers are in for a treat. Dave Barnes is also set to join Stanfill and Heath as supporting act.